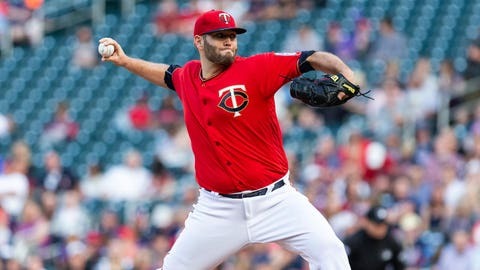 MINNEAPOLIS — The Minnesota Twins signed veteran right-hander Lance Lynn in March in the hopes of bolstering their starting rotation for a possible run to the postseason after reaching the wild-card game a year ago. Lynn (6-7, 5.21 ERA), who gets the starting nod Wednesday as the Twins wrap up a three-game series with the Kansas City Royals at Target Field, still could be a deciding factor during the season’s final months, but it may not be while wearing a Twins uniform. The 31-year-old has quietly pitched his way into the annual rumor mill ahead of baseball’s annual non-waiver trade deadline by going 5-3 with a 3.49 ERA in his last nine starts, including a 2.83 ERA in five June outings. Lynn himself is partially to blame for the Twins’ woes in 2018. He opened the season 1-4 with a 7.47 ERA through his first eight starts before turning it around. The Royals had dropped 10 in a row coming into Tuesday’s contest and will try to win consecutive games for the first time since taking the last two contests of a three-game series with the Twins in Kansas City on May 29-30. Right-hander Burch Smith (0-0, 5.40) will get his first start since 2013 on Wednesday. The 28-year-old made seven starts for the Padres in 2013 but returned to the minors a year later before missing the 2015 and 2016 seasons following Tommy John surgery. He spent last season in the Rays’ minor league system and was acquired by the Royals after the Mets selected him sixth overall in the Rule 5 draft last winter.